This is from the day before yesterday. I was working on my laptop when I realized that Nisarga has been quiet for a long time. This is very rarely good news, so I went to investigate in the kitchen. He had upended a large pot of potting mix (to plant my vegetables in) and was merrily spreading it all over the floor as he played with it. He was absolutely covered. I hosed him down and gave him a biscuit to eat, while I cleaned up the mess and returned to him with more substantial bread and butter. On my return, I found chewed up biscuit plastered all over the floor and his icky hands grabbing away at my phone. I went to clean the phone on priority and returned to find him rubbing the slices of bread on the floor – buttered side down. I’m not an enthusiastic housekeeper at the best of times and this serial mess making had me agreeing with all the comments on why some animals eat their young, etc. He wouldn’t leave the bread alone, so I figured he might as well do whatever was being planned in that tiny head. I suppose a bread would seem like a pretty efficient cleaning tool if you wanted something soft and absorbent…. He patted at the caked biscuit gunk for quite a while (I had replaced the buttered slices with normal ones for the sake of my mental health). Clearly not satisfied, he took a slice in each hand and creeped his way to the bathroom, where he proceeded to take a mug of water (he was able to get it only a quarter full) from the bucket. Now fascinated, I watched as he dipped the slice of bread in the water. I was not able to see what he was doing, but the dismayed look on his face made it clear that what bread normally does, if soaked – gets soggy and falls apart – is not what he had in mind. That was when a light bulb lit in my head. I have a small piece of sponge shaped remarkably like a slice of bread – now that I thought of it – and he was doing what I did to messes – cleaned them up with the sponge! Awwwww…. All the frustration vanished in a puddle of mommy melt. 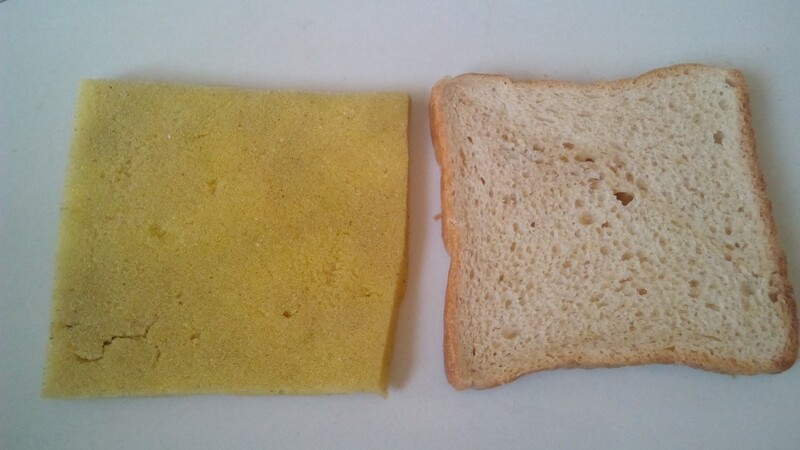 Who can blame Nisarga for thinking the slice of bread can be used for cleaning, if his mom regularly uses the sponge on the left for exactly that? I read through your blog and i must congratulate you for all the effort you have been doing by putting down all your experiences. It is of great help to parents sailing in the same boat. My younger son is a spastic diaplegic and we have been doing PT, ST and OT for him since three years now. I have been researching a lot on net like Pediasuit Therapy, Fendelkrais Therapy, Vojta Therapy, Anat Baniel Method etc. We had done hydro therapy and it helped him a lot. We would be experimenting with Pedia Suit Therapy soon. My wife will be in Mumbai next week with my son. It would be really nice if she could meet you and exchange notes on various things you have tried for Nisarga. Nisarga is a very sweet kid with an infectious smile. We shall pray for him to become independent and gets do what he wants in life.